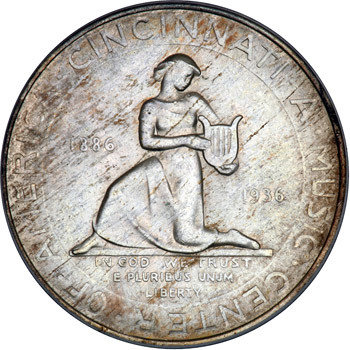 The 1936 Cincinnati Half Dollar was another in a long line of clear money grabs in the history of the classic commemorative series. Just as the Alabama “Centennial” half dollar was essentially an afterthought used to raise money, so too was the Cincinnati. 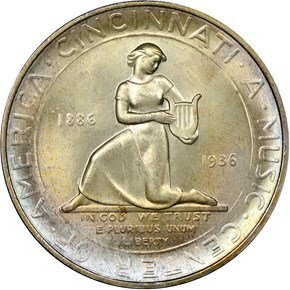 The coin was ostensibly struck to celebrate the anniversary of Cincinnati, Ohio “as a center of music,” and to commemorate “its contribution to the art of music for the past 50 years.” However, in reality, the purpose of this half dollar was to make money for a small group of coin collectors and dealers, primarily Thomas G. Melish. One of the biggest issues with the minting of this coin is that, historically, the commemorative coins were reserved for celebrating special anniversaries. In this case, however, there was no special anniversary of any sort within a decade of 1936. In fact, even the Commission of Fine Arts noted that there were a multitude of reasons not to issue this coin and advised against it. 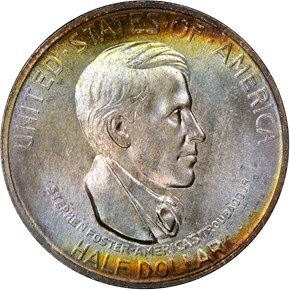 Yet, Melish and his Commemorative Coin Association prevailed, and on March 31, 1936, Congress authorized the striking of 15,000 coins at the “mints.” Melish originally wanted 10,000 pieces struck at the Philadelphia Mint, 3,000 in San Francisco, and only 2,000 in the Denver facility. This, of course, would have made the 1936-D coins instant rarities. The Congressional Act, however, was amended to specify that the term “at the Mints” meant that 5,000 pieces were to be struck at each of the three mint branches. The coin itself was designed by artist Constance Ortmeyer. 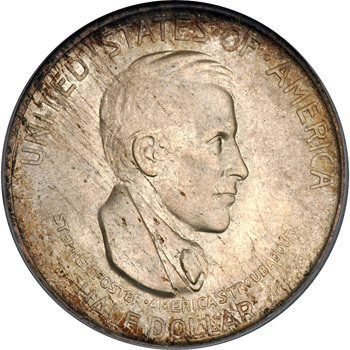 The obverse has an image of Stephen Foster, who is known as the father of American Music and lived in Cincinnati for a few years (not while writing music), which was apparently enough for Melish. The back portrays a kneeling woman which is supposed to represent the Goddess of Music. 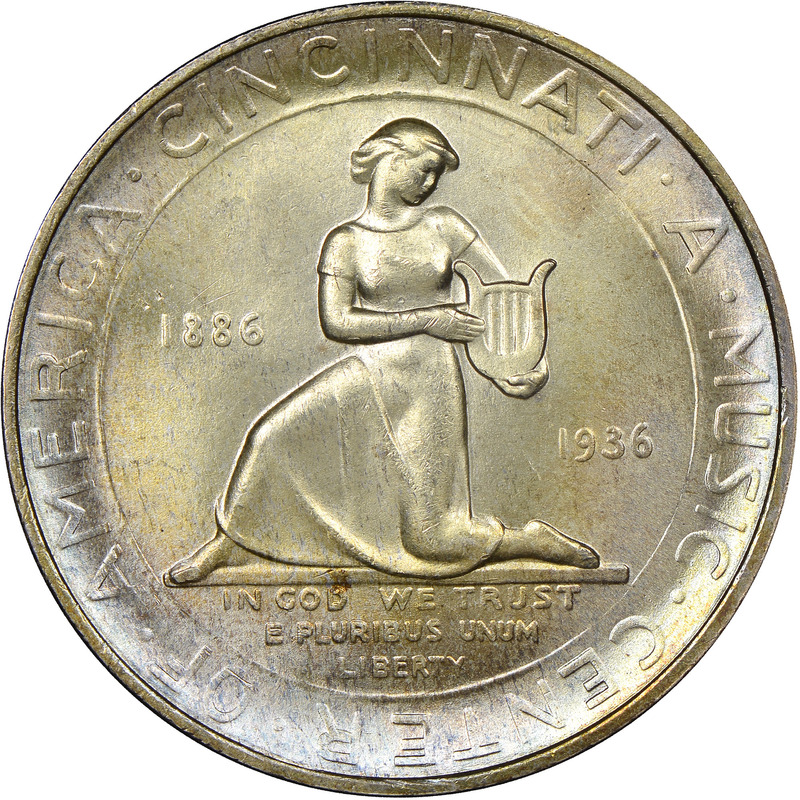 The coin itself supposedly honors the golden anniversary of the Cincinnati as the Center of Music, but if that was reality, then the coin should have been struck in 1923 as opposed to 1936. As if only to further prove to future generations that the Cincinnati Commemorative was a money grab, the 3-coin sets were issued at a costly $7.75, as opposed to the more reasonable $3 per set price point of most other commemoratives. But to add even more insult to injury, the sets (sold by Melish, of course,) were “over-subscribed,” and he began to sell sets on the secondary market for $45. In the end, Melish created the instant rarity he wanted, and today, decades later, the coins are still sought by collectors as one of the key types of the commemorative coin series.